PGH Quick Take – Tim is In!! Tim Pawlenty is in!! Oh, you knew that already. Well, now he’s made it official. 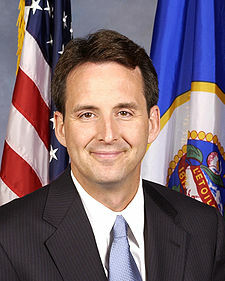 Today former Minnesota Governor Tim Pawlenty formally announced that he is running for President. That’s after yesterday releasing a web video saying the same thing…and two days after pre-announcing the pre-video announcement of the official announcement. Pawlenty made the announcement (the last one) from Iowa, the all important first caucus state. With Mike Huckabee passing on a run, Pawlenty is hoping to get the social conservative vote, which is, not surprisingly, the very same voters who dominate in Iowa. More on Pawlenty’s chances later, but for now check out the Huffington Post’s assessment of Pawlenty’s “truth tour” (named after the repetitious use of the word truth in his announcement today). Pawlenty’s scorecard, well, to tell you the truth, it was more truthiness than truth.